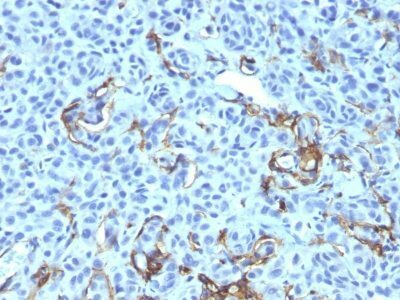 This antibody recognizes a glycoprotein of 75 kDa, identified as low affinity Nerve Growth Factor (NGF) Receptor (p75NGFR) or Neurotrophin Receptor (p75NTR). 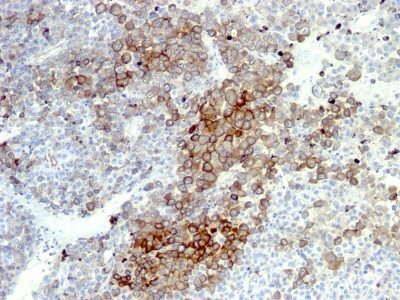 This antibody recognizes a glycoprotein of 75 kDa, identified as low affinity Nerve Growth Factor (NGF) Receptor (p75NGFR) or Neurotrophin Receptor (p75NTR). NGFR is expressed in various neural crest cells and their tumors such as melanocytes, melanomas, neuroblastomas, pheochromocytomas and neurofibromas. Reportedly, anti-NGFR is a reliable marker for desmoplastic and neurotropic melanomas. NGFR is expressed in mature non-neural cells such as perivascular cells, dental pulp cells, lymphoidal follicular dendritic cells, basal epithelium of oral mucosa and hair follicles, prostate basal cells, and myoepithelial cells. Anti-NGFR stains the myoepithelial cells of breast ducts and intra-lobular fibroblasts of breast ducts. Catalog number key for antibody number 0914, Anti-NGFR (NGFR5 NTR/912) The prefix indicates conjugation, followed by the antibody number and size suffix.